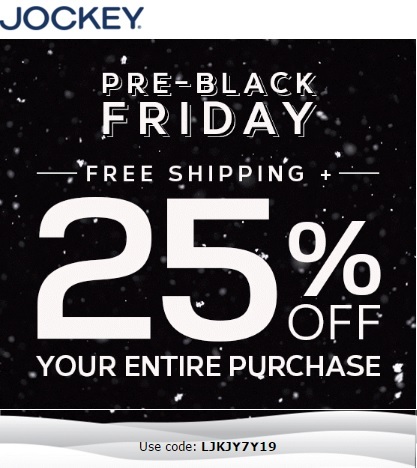 Pre-Black Friday Sale 2015 just started at Jockey. Enjoy 25% discount on your entire online purchase! Plus, free shipping with every order. Offer is valid on the official website. Offer is valid through Monday, November 23, 2015. It is necessary to use promo code to receive the offer. Promo code is available through emailing. Source of the information is Jockey. More details available on the official website.